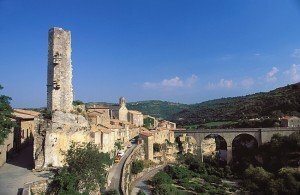 Minerve is a thirty five kilometre drive from Carcassonne. Its another stunning village within easy driving distance and was formally chosen as a winner in “Les Plus Beaux Villages de France” which is a competition run for villages of great beauty. Keep in mind that if driving to Minerve, the main bridge is only accessible to residents. In the past the village has been regarded as the centre of the Minervois wine region. Make no mistake this is a beautiful part of the world and once you arrive here by car, you can then easily take it all in on foot. You can walk by cliff sides and under hills through tunnels as you hear the water from the river Cessiere roll on. When the water is low you can make more ground, just be sure to take in some advice from locals.